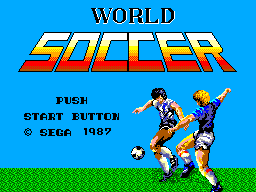 World Soccer (ワールドサッカー), known as Great Soccer in the US (though not the same as Great Soccer released in Europe and Japan), and Super Futebol in Brazil, is a sports game developed and published by Sega for the Sega Master System. The game was re-released in Japan a year later under the name Sports Pad Soccer (スポーツパッドサッカー), which was bundled with the Sega Sports Pad. Main article: World Soccer/Magazine articles.